The history of “Conte a Paris” products cannot be separated from the personality of the company’s founder, Nicolas Jacques Conte. Born in 1755, he claimed the title of painter, chemist, physicist, hot air balloonist and inventor during the fifty years he lived. Nicolas Jacques Conte’s historical achievement is undeniable. 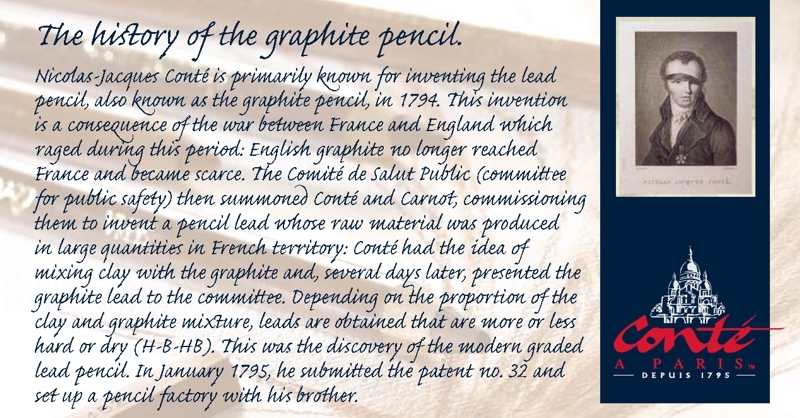 In 1794, he developed the modern graphite lead from a mixture of clay and graphite, thus making it finally possible to create different grades of hardness for pencils. The pencil factory he set up in 1795 enabled France to at least produce its own calligraphy and drawing material. A few years later, he developed “pencils without sleeves” (bare leads) replacing those made from “Italian stone”. He worked on making the colours “fixed and unchangeable” to meet the requirements of the painters of the day. Artists’ pencils and pastels were thus born. Over the decades, the quality of its products and the extent of its ranges have enabled Conte a Paris to establish itself as a true reference for artists world-wide. Used by top masters, amateur artists and art students alike, Conte a Paris offers the widest variety of techniques and effects possible for drawing, sketching and pastel work.